This is the mix I use for convenience when I don't want to make cornbread from scratch. This 3-quart, 9x13 baking dish gets lots of use in my kitchen. The cover is especially convenient for refrigerating make-ahead recipes like this one. Cumin and coriander are the secret ingredients in my family's stuffing recipe. Click below for coriander. This is the classic herb blend used for seasoning stuffing and poultry soups. I use this spatula for stirring when I saute and stir fry (like the onions and celery in this recipe). It's safe to use on any surface and can tolerate 600 degree heat. I use this painter's tape for labeling food for the fridge and freezer. It sticks well, yet removes easily without leaving behind a gummy residue. These little seeds add a nutritional punch to stuffing. Their neutral flavor makes them a great addition to many recipes like oatmeal and smoothies. A make-ahead, healthy makeover of a favorite 50-year-old family recipe. Heat olive oil in skillet on the stove top over medium-high heat. Add onion, celery, poultry seasoning, pepper, coriander, cumin, salt, and almonds. Continue to cook, stirring frequently, until onions and celery are soft and just beginning to brown. Preheat oven to 350 degrees; coat 9x13 baking dish with cooking spray and set aside. In a large bowl, combine dried bread, chia or ground flax seeds, and sauteed veggies and seasonings along with any browned bits from the bottom of the skillet. Pour in 4 cups of broth, stir, and let rest a few minutes for broth to get absorbed. Continue to stir in more broth, as needed, until dried bread is completely moistened. It usually takes a total of around 5 cups of broth. (The actual amount of broth needed can vary depending on the dryness of the bread used.) Taste a sample of the mixture to make sure it has enough salt and other seasonings; add more, if needed. (Note: It's important for safety reasons to taste and adjust seasonings before raw eggs are added.) Stir beaten eggs into the stuffing mixture. Transfer stuffing mixture to prepared baking dish. Bake uncovered for approx. 1 hour, or until sides and bottom are visibly browned. Stuffing may be mixed, transferred to baking dish, covered, and refrigerated for 1-2 days before baking. Remove from fridge and rest on counter, uncovered, for 30 minutes to bring to room temperature before baking. 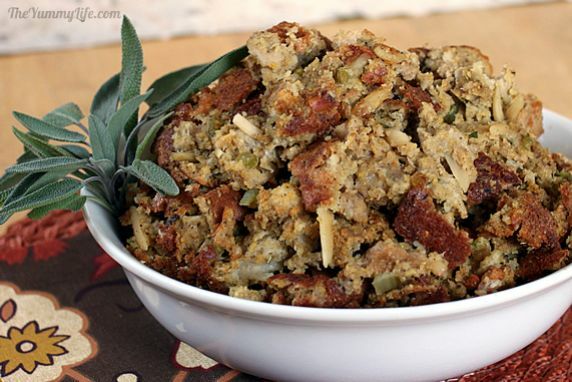 Tip for easy added nutrition: Add chia seeds or ground flax seeds to your stuffing. 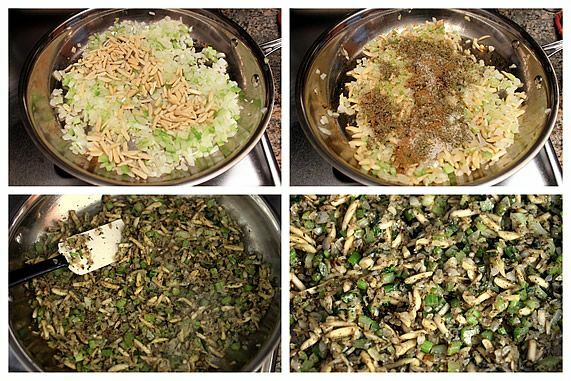 These mighty seeds completely disappear into the stuffing (no one will know they are there) while adding fiber and nutrients. Dressing or Stuffing? Cooked inside the bird or in a baking dish? Soggy or crumbly? Plain or with fruit, sausage, or nuts? 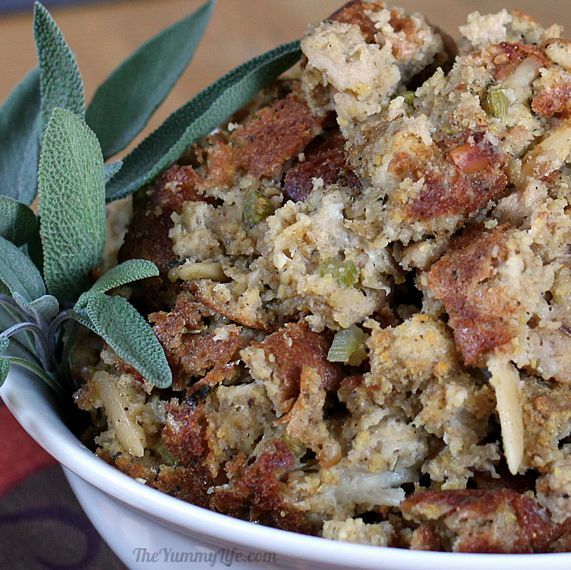 There is much debate about what makes good stuffing--or dressing--whatever you call it. Me? I call it both dressing and stuffing, but more often dressing. I like it cooked in a baking dish resulting in crispy brown edges and moist (but not soggy) stuffing. No fruit or sausage in mine, but I do add some almonds. This is one of those traditional foods that many people feel passionately about. Lots of us simply like it prepared the way our mothers or grandmothers made it. That's definitely the case in my family. Although the recipe I'm sharing today has been tweaked through the years, this is very close to the way my mom (aka Grammy) has been making cornbread dressing for at least 50 years. She learned it from her Southern-cooking mother. I'm not sure exactly how far back the origins of the recipe go before that. My mom did add her creative touch to the recipe when she began seasoning her cornbread dressing with cumin and coriander, in addition to traditional poultry seasoning. That may sound like an odd combination to you, but in our family it has become the only way to season stuffing. Most newbies who taste it can't quite put their finger on what's different about it, but it consistently gets rave reviews. Healthified. 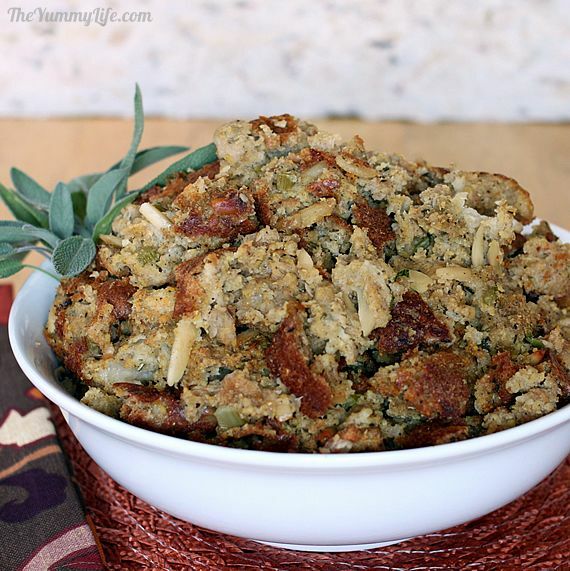 Unlike most stuffing recipes, my cornbread dressing has zero butter. Two tablespoons of olive oil is the only added fat. I use mostly whole grain breads with equal portions of whole grain cornbread, whole wheat bread, and white bread (a little white bread is needed to lighten up the texture a bit). Chia seeds (or ground flax seeds) completely disappear into the stuffing (no one will know they are there) while adding a nutrition boost. I like to throw in some slivered almonds for crunch, flavor, and nutrition, too. Stuffing is by definition one big carb-fest; but as carbs go, and certainly as stuffing goes, this is a healthy recipe. low-sodium chicken broth -- homemade or store bought; Swanson's Organic Chicken Broth is recommended by Cooks Illustrated for the best flavor. Make-ahead tip: You can bake and crumble the cornbread and cube the whole grain and white bread well in advance. 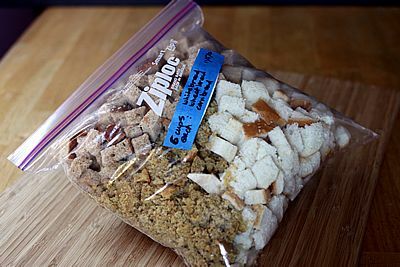 Combine the 3 breads in a gallon size ziploc bag and freeze it for up to 1 month. Step 2. The bread needs to be dried so that it will absorb the broth and other seasonings better and make for a more flavorful stuffing. There are two ways of doing this. Spread out the bread cubes and crumbled cornbread on two large baking sheets. Leave the trays of bread out on the counter to dry for 1-2 days. Step 3. Chop the celery and onion. Step 4. Heat the olive oil in a skillet over medium-high heat. 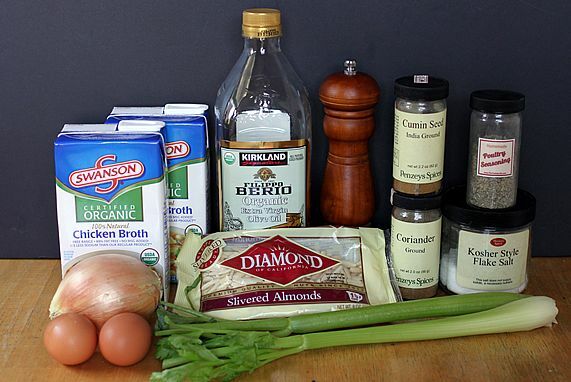 Add the onions, celery, almonds, and seasonings. Continue to cook, stirring frequently, until onions and celery are soft and just beginning to brown. Step 5. 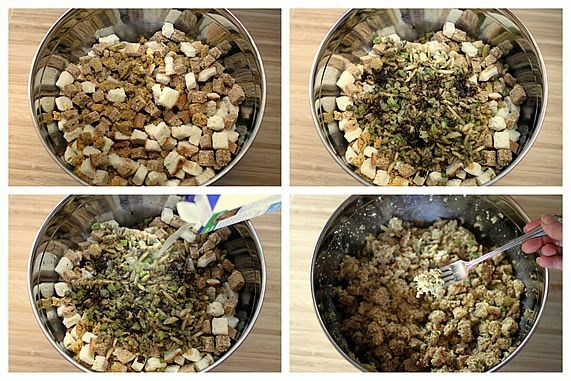 In a large bowl, combine the dried bread cubes and crumbs. Add the sautéed veggies and seasonings along with any browned bits from the bottom of the skillet. Step 6. Pour in 4D cups of broth, stir, and let rest a few minutes for the broth to get absorbed. Continue to stir in more broth, as needed, until dried bread is completely moistened. (The actual amount of broth needed can vary depending on the quantity and dryness of the bread used.) I added a total of 5 cups of broth to this batch. Step 8. Whisk the eggs and stir them into the stuffing mixture. 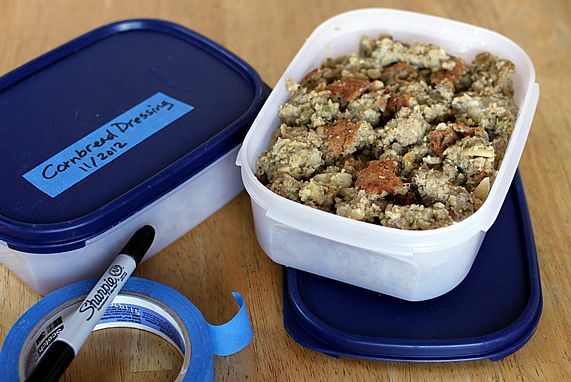 The eggs serve as a binder to hold the stuffing together. 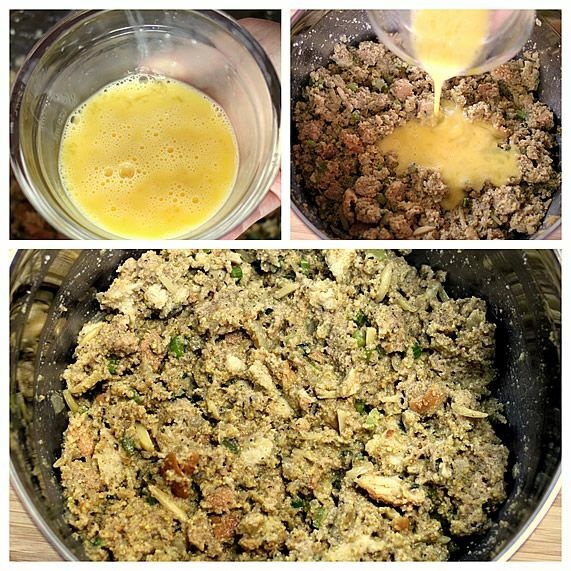 If you prefer a more crumbly stuffing, omit the eggs or use 1 egg instead of 2. Step 9. Transfer the stuffing mixture to a 9x13 baking dish that has been coated with cooking spray. I like to use a glass baking dish so I can check the edges and bottom for brownness to determine when to take it out of the oven when it's baked. Make-ahead tip. At this point, you can cover the filled baking dish and refrigerate it for 1-2 days. Remove it from the fridge and let it rest on the counter for 1/2 hour to bring it to room temperature before baking it. For a prettier presentation, bake the stuffing in a bundt pan. 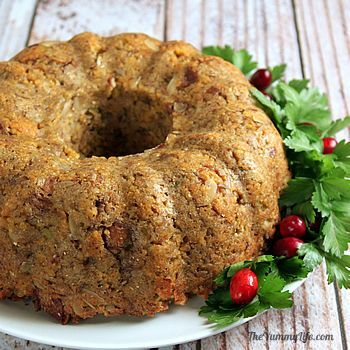 I explain how in my post: Cornbread Stuffing in a Bundt Pan. Step 10. Bake it uncovered at 350 degrees for approx. 1 hour, until the edges and bottom are browned. The combination of the browned edges and moist center are so good! 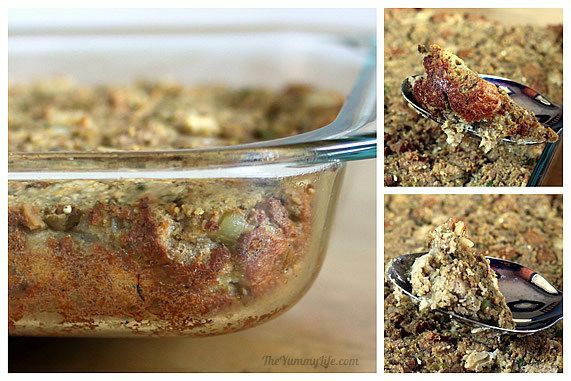 You can serve the stuffing directly from the baking dish or spoon it into a serving bowl. Fresh sage or parsley makes a pretty garnish. Leftovers. I put leftovers in a 2-serving freezer containers (for King-Man and myself). They can be frozen for 2-3 months and are great to have ready for reheating and enjoying with a rotisserie chicken for a quick meal down the road. To reheat, put the stuffing in a covered oven safe dish and heat at 350 degrees for approx. 30 minutes. Or, heat it in a skillet on the stove top to restore some of the crispy bits. Tip. I use blue painters tape for labeling food for the fridge and freezer. It sticks well but is easily removed without leaving a sticky residue. 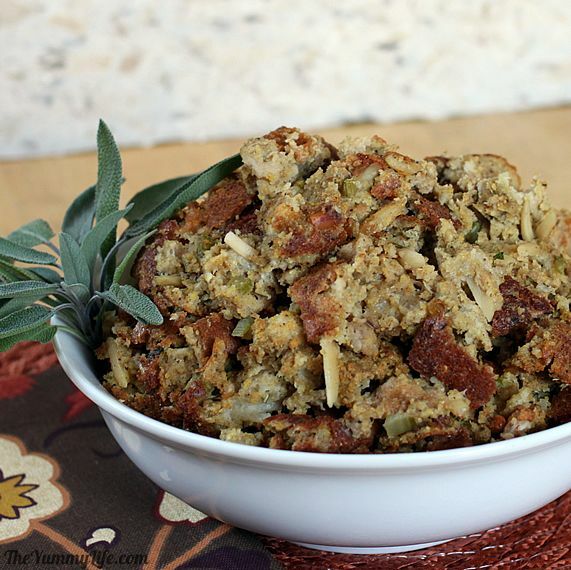 I love the flavor and texture of this old family stuffing recipe. What kind of stuffing do you like?